This policy and procedure applies to all employees of the Royal Victoria Regional Health Centre (RVH) as well as volunteers and students. These individuals shall be referred to collectively as workers herein. The requirements apply whether working on RVH property or working on behalf of or representing RVH elsewhere. Please refer to Corporate Administrative Policy and Procedure, Service Provider, Vendor and Contractor Health and Safety for dress code requirements that apply to those individuals. At RVH, Safety is Our Promise. We are committed to providing a safe and professional working environment. To that end, this policy and procedure establishes a dress code that ensures compliance with legislated occupational health and safety (OHS) and infection prevention and control (IPAC) requirements, in addition to visually demonstrating our commitment to excellent patient-centred care. 1. Decrease the risk of transfer of infectious organisms from one person to another, one area to another, and into the community. 2. Decrease the risk of worker injury. 3. Present a professional image to support the public’s perception of safe, high quality care. Artificial fingernails: Includes but is not limited to acrylic nails, overlays, tips, bondings, extensions, tapes, inlays, and wraps. Direct patient care: Direct physical hands-on care of, or physical assessment of the patient (e.g., bathing/washing, turning, changing clothes/dressings, caring for open wounds/lesions, toileting, providing incontinence care, ambulating, collecting specimens, performing imaging, etc. ), regardless of frequency. Given the extensive contact Environmental Services (EVS) has with the patient environment, EVS Aides shall comply with these provisions. For anyone else entering the patient environment or interacting with patients or patients’ bodily fluids, where there is a doubt of the level of precaution required, a risk assessment of the nature and duration of interaction shall be done and the appropriate provisions followed accordingly. Please refer to the Corporate Dress Code Frequently Asked Questions (FAQ) for examples of this type of risk assessment. Good repair: The item shall not be torn, patched, faded, stained, wrinkled, frayed, or visibly soiled. Personal alert device: Any portable audible and/or transmitting equipment worn by workers, in accordance with Corporate Administrative Policy and Procedure, Workplace Violence Prevention (e.g., Staff Alert Pendant, SMART badge, portable Code White button, GIT police call button, etc.). 1. Consistently adhere to, personally model and enforce this dress code policy and procedure as well as any additional department-specific requirements that may apply. 2. Address worker failure to adhere to this dress code policy and procedure via re-education and progressive discipline, as appropriate. 1. Follow the provisions set out in this dress code policy and procedure as well as any additional department-specific requirements that may apply. The observance of this policy and procedure constitutes a condition of employment or contract requirements for all workers of RVH (as defined above). Failure to abide by the provisions set out herein shall result in re-education and progressive discipline, as appropriate. RVH workers shall present themselves in a manner taking into consideration professionalism, cleanliness, health and safety, and infection prevention and control measures. All workers are expected to exercise good judgement in their apparel and grooming habits based on their employment responsibilities. Please note: The provisions below are intended to cover standard RVH functioning and conditions. It is reasonable and understood that in the case of emergency (e.g., codes, large-scale emergencies/disasters, returning when on call, etc. ), exceptions will occur. a) The RVH identification badge, SMART badge and applicable personal alert device. are mandatory parts of the dress code and shall be worn at all times. These items shall be worn in the upper left quadrant and such that the name and photo are visible at all times. Non-RVH decals or stickers, shall not be placed over any part of the front of the identification, SMART badge and applicable personal alert device unless authorized to do so. The identification, SMART badge and applicable personal alert device shall be clipped to the clothing or on a retractable badge holder (as appropriate for the type of device). They shall not hang from a lanyard or necklace of any kind. The only exception shall be in the case that they impede direct patient care (by dangling into the field) in which case they may be temporarily moved but then shall be returned to this area upon completion of the direct patient care. b) Where required under the Health Care and Residential Facilities Regulation and/or the Industrial Establishments Regulation, both made under the Occupational Health and Safety Act, or any other applicable governing body or best practice standard, a more prescriptive department-specific dress code shall supersede this policy. c) Where required, personal protective equipment (PPE) shall not be compromised or impeded in any way by the worker’s attire, jewellery or hair (including facial). Please refer to Corporate IPAC Policy and Procedure (2018) Personal Protective Equipment in Infection Prevention and Control for more information. Those seeking a religious exemption regarding facial hair and respiratory protection shall consult with Occupational Health and Safety. d) Where there is a reasonable risk of exposure to a biological, chemical, physical, or radiological hazard, workers shall wear the appropriate and/or required uniform, protective clothing and/or personal protective equipment to prevent or minimize contact with that hazard. The extent to which that reasonable risk exists is defined in the applicable Job Demands Analysis for each position, available on the RVH intranet. e) All workers shall wear safe and appropriate footwear in accordance with the applicable level of risk (low, moderate or high) for their job. Please refer to Corporate Administrative Policy and Procedure (2018) Footwear for more information. f) All workers shall wear safe clothing that does not create an entanglement or pulling hazard (e.g., long strings on clothing, scarves, long necklaces, lanyards, etc.) or a tripping hazard (e.g., too long pant cuffs or dress/skirt hems) within the context of their typical work duties and work environment. g) Every effort shall be made to accommodate a worker’s religious dress requirement, providing it does not violate legislated occupational health and safety and/or infection prevention and control requirements. i. The use of personal care and laundry products containing scents shall be limited to the extent reasonable as these may cause headaches, nausea or respiratory distress in individuals who are compromised, asthmatic, ill, or otherwise sensitive. Note that products labeled “scent-free” or “unscented” may nonetheless contain compounds that trigger such individuals. Please refer to the Corporate Administrative Policy and Procedure (2018) Scent Reduction for more information. ii. Hair styles and hair ornaments shall be such that they do not pose an entanglement hazard and do not obscure vision while performing typical work duties. iii. Fingernails shall be kept trimmed, clean, and at a length that shall not impede performance of typical work duties. i) If a worker’s long hair, loose clothing or jewellery presents a hazard within the context of typical work duties, it shall be suitably confined. j) Personal garments and/or underwear shall not be visible through clothing or above the waist band of outer clothing. k) Midriff-baring, back-baring, buttock-baring, cleavage/chest-baring, and skin-tight attire shall not be worn. l) Hats or caps shall not be worn other than for workers whose typical work duties include working outside, as applicable. a) Business or business casual standards shall apply, as appropriate for the worker’s responsibilities. This is attire that is not as formal as a suit and tie, dress, skirt and blouse, etc. Business casual does not mean that anything goes but rather that less formal professional attire is permitted. The attire promotes a professional environment. Please refer to the table below for examples of appropriate and inappropriate attire. Note that the table is not intended to provide an exhaustive list of examples but rather to serve as a guide. a) All uniforms or personal scrubs shall be clean (fresh daily), fit properly, allow for ease of movement and unrestricted performance of typical work duties, and be in good repair. It is preferred that these not be worn to and from RVH property nor be worn in public places off of RVH property. b) Where applicable, RVH-issued uniforms shall only be worn while on duty. c) Facial hair shall allow for the safe and secure use of N95 (or more protective) respirators, where applicable (or ready access to a razor shall be ensured to shave respirator contact points on the face when required). Occupational Health and Safety shall advise on the appropriate type and use of respiratory protection for those seeking a religious exemption regarding facial hair. d) Jewellery, including facial and ear piercings, shall be such that they are worn tight to the body and do not pose an entanglement or pulling hazard while performing typical work duties. Medic-alert jewellery shall be exempt. a) Sleeves shall be sufficiently short (i.e., bare below the elbow) in order to promote good hand hygiene techniques and to prevent potential cross-contamination. Hoodies, warm up jackets, lab coats and long sleeve shirts shall not be worn when providing care, transferring patients or in an area/situation where one may be called upon quickly to provide care (i.e., interprofessional stations). b) Personal protective equipment (e.g., yellow isolation gowns, surgical/procedure masks, gloves, etc.) shall not be worn outside of patient care areas or for purposes other than following isolation and/or occupational health and safety protocols (e.g., when transporting a patient on precautions from one area of the hospital to another). c) Hand jewellery and watches shall be limited to a smooth band without projections, etchings or stones in order to prevent patient injury and/or perforation of gloves. d) If rings and watches are worn, they shall be washable, with no crevices, and shall be properly cleaned before and after each patient contact. e) Artificial fingernails shall not be worn at any time while working. Natural nails shall be clean, well-cared for and shall not show past the end of the finger. Fingernails are to be kept polish free. f) Hair shall be worn in such a way that it does not obscure vision or come into contact with the patient. If hair is shoulder-length or longer, it shall be pulled back and secured away from the face. It shall be neat and clean. g) Skin shall not be bare (exposed) below the waist. The personal attire or scrubs or uniform shall provide an adequate barrier against the risk of exposure to a biological, chemical, physical, or radiological hazard. h) Ties and bracelets (with the exception of medic alert bracelets) shall not be worn. i) Additional layers (including long-sleeved items) may be worn to provide additional warmth when not providing direct patient care but shall be removed while performing direct patient care. These items shall be clean and laundered regularly. j) Workers who wear laboratory coats shall adhere to department-specific policies. Please refer to the companion Dress Code FAQ for further details on the above. RVH Identification Badge, SMART badge and applicable personal alert device. Any departmental requirements that supersede the Dress Code as a result of increased OHS and/or public health requirements shall be observed. Association for Professionals in Infection Control and Epidemiology (2005), Hand Hygiene, Vol. 1, 3 (19). Halliwell, C., & Nayda, R. (2011). 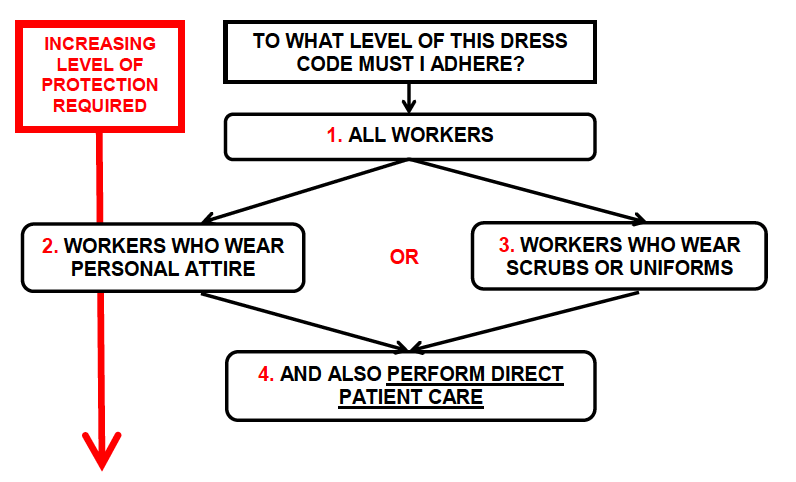 Nurses’ uniforms – The missing link in breaking the chain of hospital acquired infection? Healthcare Infection, 16, 24-28. London Health Sciences Centre (2011). Policy Administration: Infection Safety and Personal Attire. The Ottawa Hospital (2010). Corporate Policy and Procedure Manual: Dress Code. This policy and procedure applies to all employees of the Royal Victoria Regional Health Centre (RVH) as well as professional staff with RVH privileges (i.e., medical, dental, midwifery, and extended class nurses), students, and service providers. These individuals shall be referred to collectively as workers herein. The requirements apply whether working on RVH property or working on behalf of or representing RVH elsewhere. if a worker is exposed to the hazard of slipping on a work surface, the worker shall wear footwear with slip-resistant soles. Protective footwear: A boot or shoe that provides the wearer with a degree of protection against injury (as specified in the CSA Standard). Low Risk: Applies to those workers who work in typical office environments and non-clinical areas (i.e., where clients/patients may be assessed or counseled but are not provided hands-on care or service). Moderate Risk: Applies to those workers who work in inpatient and outpatient clinical areas where clients/patients are provided hands-on care or service, as well as anyone supporting/managing AND frequently accessing those areas, whether normally positioned within those areas or accessing them from elsewhere. Also applies to support service workers (with some exceptions noted in high risk category). High Risk: Applies to those workers who work in areas involving loading/shipping/receiving, mechanical, storage/transfer, renovation/construction areas, as well as anyone supporting/managing AND frequently accessing those areas (while heavy work in progress), whether normally positioned within the those or accessing them from elsewhere (while heavy work in progress). This includes Environmental Services moving porters, Facilities and Building Operations, Capital Planning and Redevelopment (when entering construction areas), and Procurement/Materials Management (who work in the shipping and receiving area). Slip resistance: A property of footwear (e.g., sole material, shape or softness/hardness, tread design, or shape of heel) that reduces slipping on specific surfaces. The requirements and examples below are appropriate for INDOOR use only. When walking or working OUTDOORS, safe WEATHER- AND SURFACE-APPROPRIATE footwear shall be worn on all RVH external grounds, parking lots and walkways. This includes non-RVH property when working on behalf of RVH. Please note: the photos below are not intended as a brand endorsement and are not exhaustive. They are provided merely as examples. RVH Corporate Administrative Policy and Procedure (2018) Employee Injury-Illness-Hazard Reporting. RVH Corporate Administrative Policy and Procedure (2018) Preventing Slips, Trips and Falls. 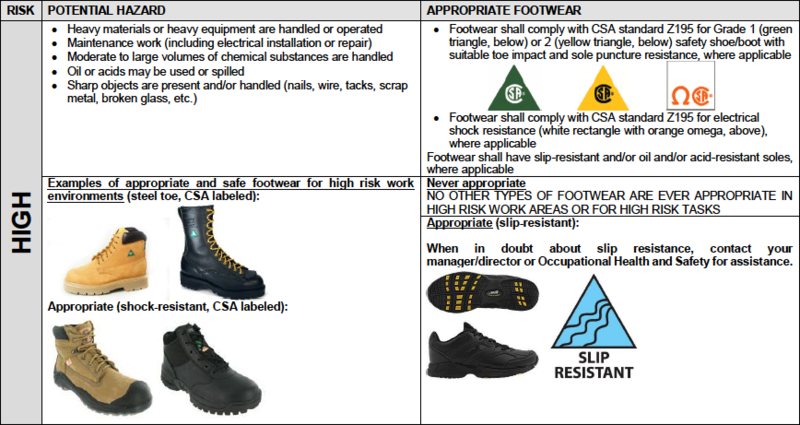 Canadian Standards Association (CSA) Standard Z195-09 Protective Footwear.